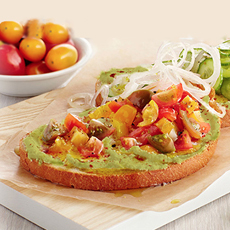 Top: Fully Loaded Avocado Toast. 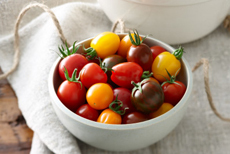 Center: A medley of cherry and grape tomatoes. Bottom: Mini cucumbers. Photos courtesy Sunset Produce. Over the last few years, Avocado Toast has been spreading from casual dining spots to coffee bars. The concept started as part of the trend to eat more nutritiously (avocado nutrition). It falls in the “nutritious and delicious” category. We first saw Avocado Toast in the form of seasoned, chunky mashed avocado on whole grain toast—perhaps garnished with sprouts or halved cherry tomatoes. As its popularity grew, so did the creativity. Today’s tip is: Design your ideal Avocado Toast recipe. Ours includes capers, fresh basil, pimento, sweet onion, tomato or sundried tomato, and a balsamic drizzle on crusty country loaf toast. Sometimes we add slices of hard-boiled egg. Avocado toast can be served for breakfast or snacks, or as smaller hors d’oeuvre (crostini). This recipe, from Chef Roger Mooking for Sunset Produce, uses the brand’s mini cucumbers and Wild Wonders mix of cherry and grape tomatoes in red and orange. Prep time is 15 minutes. 1. SEPARATE the shallot slices into individual rings. Submerge them in a bowl of cold water and let stand for 10 minutes. Drain and discard the water. 2. TOAST the bread lightly, place a slice on each plate and spread 2 tablespoons of avocado on each slice. Top the avocado with a pinch of smoked paprika. 3. DIVIDE the tomatoes, then the cucumbers, on top of the avocado. Sprinkle with a pinch each of cracked black pepper (you can crush peppercorns in the mortar, too), lemon zest, sea salt and ground fennel seed. Place the shallot slices on top or to the side. 4. DRIZZLE 1 teaspoon of olive oil on top of each slice to finish. Serve immediately. Miso may seem an unusual pairing with avocado, but the flavors are very complementary. This recipe from Quinciple features an unusual ingredient: hozon, a proprietary miso-style spread made by David Chang’s Kaizen Trading Company. Hozon isn’t yet available to consumers outside of Quinciple’s meal delivery service, but you can substitute regular miso. The difference is that traditional miso is made from fermented soybeans, and hozon is made from fermented legumes, nuts and seeds. You can easily whip up miso compound butter or hozon compound butter (recipe below). It gives umami flavor and savory contrast to the avocado toast. 2. 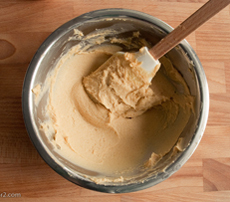 WHISK together the butter and hozon in a small bowl, until combined. Otherwise, coat each piece of toast generously with miso compound butter (recipe below). 3. SLICE each avocado half as shown in the photo, and press down gently to fan out the slices. 4. ARRANGE each fanned avocado half atop a piece of toast. Garnish with scallions, sesame seeds and salt. 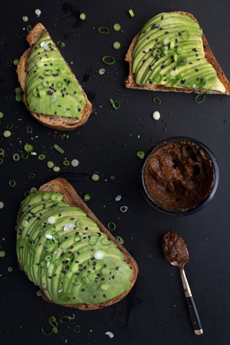 Top: Avocado Toast with hozon butter, an alternative to soybean miso paste. Photo courtesy Quinciple. Bottom: Miso butter, a compound butter. Photo courtesy MomofukuFor2.com. Compound butter is classic French ingredient: a blend of unsalted butter with another flavor ingredient that complements the particular recipe. It can be anything from blue cheese to nuts, herbs, spices and citrus. Here’s more about compound butter. Optional minced seasonings: chives or green onions, garlic, ginger; citrus zest; red pepper flakes. 1. BLEND the butter, miso and pepper with a small whisk or a fork. 2. BUTTER the bread; roll the remainder into a log shape in plastic wrap and refrigerate or freeze. You can cut off slices to garnish chicken, fish or steak (lots of umami); vegetables; potatoes or rice. The avocado is a tree that is native to south central Mexico. Botanically, the fruit is a large berry containing a single seed (the pit). Avocados have been cultivated in Central America for some 7,000 years, although they didn’t arrive in the U.S. until in 1833 in Florida. They were planted in California in 1856. Today California is the largest producer of avocados in the U.S., followed by Florida and Hawaii. Although we only see a handful in supermarkets, there are more than 80 varieties of avocado. The most popular is the Hass avocado. Americans eat an average of 4.5 pounds of avocado per year. About 50 million pounds of avocados are consumed in the U.S. on Super Bowl Sunday.